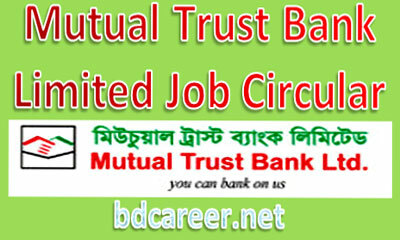 Mutual Trust Bank Limited Job Circular 2019 Latest. Mutual Trust Bank Limited is fast growing commercial Bank in the Banking sector have been published a vast Job Circular on March 2019. Mutual Trust Bank one of the well-diversified private commercial bank, based in Dhaka, Bangladesh. Eligible & Interested candidates are requested to Apply Online after fulfilling the circularized conditions and instructions. Deadline for Submitting Electronic Application See the particular Job circular for details. Mutual Trust Bank started its banking operation on October 24, 1999, after granted license on October 05, 1999 by Bangladesh Bank under the Banking Companies Act 1991. The Company was incorporated as a Public Limited Company in 1999, under the Companies Act 1994. To know more details please see the attached image Job Circular below. Published Date: Please See the particular Job circular for details. Job Title: Please See the particular image Job circular for details. Interested candidates are requested to log on to www.mutualtrustbank.com for completing the application form and submitting it through the MTB e-Recruitment System for the vacant positions after fulfilling the circularized conditions and instructions above. The See the particular Job circular for details.